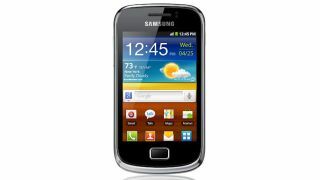 Samsung has shipped off its compact Galaxy Mini 2 Android smartphone for sale in the UK from today. We first saw the phone at MWC back in February where we were impressed by the new model which brings a bigger battery and better screen into the mix. Samsung's Simon Stanford said that the Galaxy Mini 2 is designed to "meet the growing demand for more affordable devices for customers on the lookout for their first smartphone". Running Android 2.3 Gingerbread on an 800MHz processor with 512MB of RAM, our hands-on test at MWC showed the Galaxy Mini 2 to be surprisingly nippy for a budget handset. On the outside it's not quite as tiny as its name would suggest, with a not-unreasonably-small 3.27-inch (320 x 480) touchscreen and a middling 11.9mm thickness. There's 4GB of storage inside and a 1300mAh battery, and it carries the same 3MP camera on the back as the original Galaxy Mini. If you're looking for a compact, budget phone you can get yours for free on a £15.50/month 24-month contract from T-Mobile now.